What is GOTV (Voter Tracking)? This chapter describes the everyday tasks to conduct and manage petitions. To view, manage and edit your petitions, click Campaigns > Dashboard > Petitions. When your petition is ready, you will want to publicise the URL where people can sign it. Go to Campaigns > Dashboard > Petitions. Click More > Sign next to the name of your petition. You will see your petition; copy the URL and use this link to email to your existing contacts, or add to your web site for individuals to sign your petition. Once you have publicised the URL for your petition, people will be able to complete the form, answer the questions and submit their response. Click Campaign > Dashboard > Petitions. Click More > Signatures next to the name of your petition. You can then choose to view the petition activity for an individual, or select contacts and perform activities such as sending an email to the contacts, or a batch update via profile. To review all or some of the results from a petition, use the Activity Report. Go to Reports > Create Reports from Templates > Activity Report. In the Display Column area, select any fields you would like to view on the report, such as Target Contact Email. 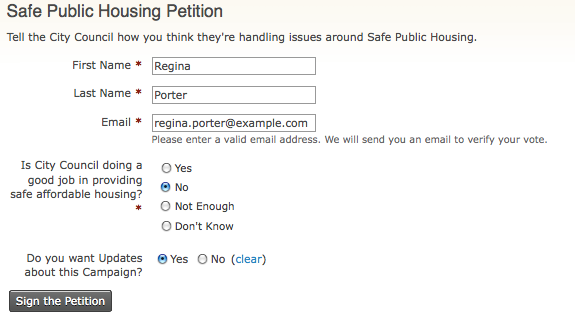 Expand the Petition Questions area and select the criteria you want to see, such as specific responses to a petition question. Click Preview Report to view the results. You can also export the survey report information to a CSV file to do more detailed reporting of the results.